Back in 2005, a guy I knew was moving. He didn't want to take everything with him so he was parceling out some of his possessions to various friends. When he got to me, I took a floor lamp, one whose bulb reproduced natural light. Over the years, I have gotten a lot of use out of it. It works so much better for lighting the room where the computer is. The overhead light often produced glare on the screen. This lamp didn't and could be moved, due to the flexible neck, to a position that was positive for interior lighting. But, as with a lot of things, its time had reached an end. The base was the first to crack, around where the pole and the base met. Gotta love duct tape. 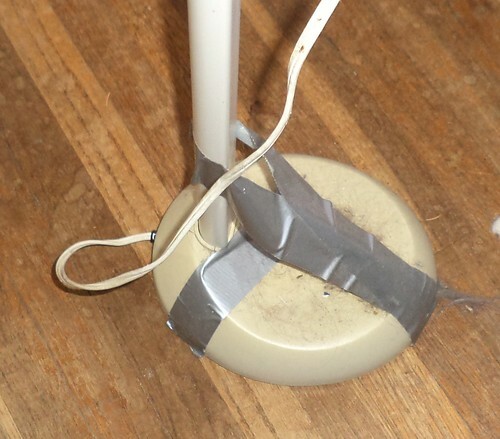 I had to be careful when I moved the lamp for cleaning, but the taping kept the pole upright. But then, the flexible tube cracked where it met the actual light. 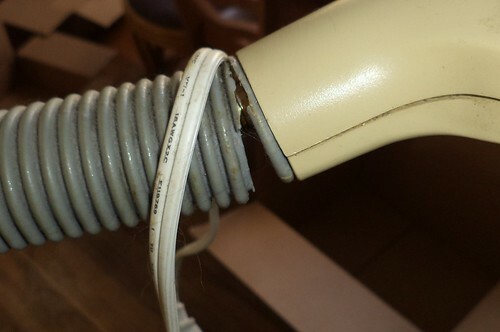 This is simply the age of the plastic and the stress of attachment to the lamp head causing the cracking. I don't know how long he had the lamp before he gave it to me, but 8 years in my possession is a good long time. I've replaced the bulb in this twice. It's made by Verilux, so I went to their web site to see if the floor lamp had also been purchased there. It had. Based on comparison shopping, buying from the manufacturer was $2 more expensive than buying from Overstock.com, plus I had a better warranty. The lamp arrived last week. It wasn't explained that this is a "some assembly required" product, so, when the box arrived, I looked at the old lamp and then at the box and wondered how what I had fit into what was shipped. Ah, this is how. The hardest part of assembly was getting all the pieces out of the box. The pole is attached to the base and the light head. While its construction is very sturdy, you are advised not to pick up the pole and let the base dangle. The base is weighted and you could break some of the cords running through the base. Once you get the pole snapped into the hole in the base, you use a screw to secure the connection. Then you snap the flexible neck into the top of the pole and secure that with a screw. The light bulb (included, huzzah) snaps into the head and the head has a deflector screen which my old lamp didn't have. That snaps into the head as well. Plug the whole thing in and, viola, I have a sturdy, brand new floor light in the office. Clean up was a breeze. All the packaging is recyclable, assuming you can recycle plastic bags and cardboard. 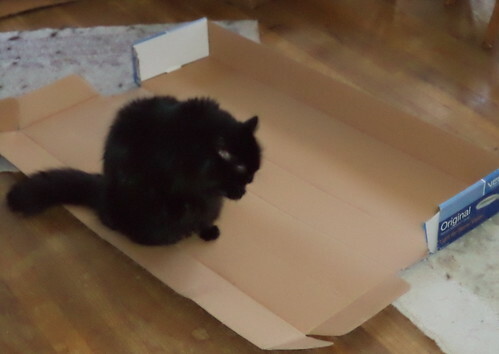 The cardboard is sturdy but it was easy for me to tear the boxes, both the product box and the shipping box, into the right size pieces to fit in the recycling can. This product comes with my recommendation. If I get half as many years out of the new lamp as I got out of the old one, I'll be thrilled. The old one has been moved into the kitchen where I have lighting issues. I won't be moving it beyond side to side when I clean the floor so I don't have to worry about being electrocuted accidentally by the cracked tube on the neck. When the kitchen lighting issues are solved, the lamp can be tossed and the bulb saved as a spare. As I said, I've replaced the bulb twice. In neither case was it because the bulb had burned out. If you knock the lamp over onto the floor, the bulb will break. I have no idea how long the bulb is supposed to last. I did have to wait to recycle the box, however.